In a Dutch oven or heavy-bottomed pan, heat olive oil over medium heat. Add the onions or leeks and fennel and cook with a pinch of kosher salt until just tender, about 5 minutes. Stir in garlic, red pepper flakes, rosemary sprigs, and pancetta. Cook, stirring occasionally, 5 minutes. Remove and discard rosemary stem and larger rosemary leaves. If less fat is desired, remove pancetta. Pancetta may also be diced, at this point, and used as a garnish. Using an immersion blender or a food processor, puree 1/2 of the beans to thicken the soup. Add the shredded escarole and cook until wilted and tender, about 30 minutes. Season to taste with kosher salt and freshly ground pepper. 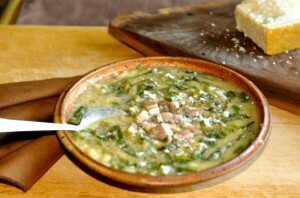 Serve soup in bowls garnished with reserved chopped pancetta, if using that way, Parmesan and a drizzle of olive oil.